The Manchester United player has urged his team-mates to stick together ahead of their World Cup qualifier against Malta. 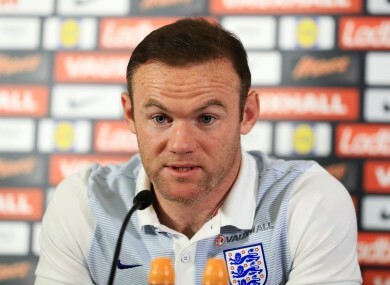 England captain Wayne Rooney speaks to the media. ENGLAND CAPTAIN WAYNE Rooney has called on his team-mates to stick together as they get back to work following Sam Allardyce’s shock departure. Allardyce was forced to resign as England manager after just 67 days and one game in charge following his controversial comments to undercover newspaper reporters investigating football corruption. Gareth Southgate will serve as England’s interim boss for the next four matches and one of his first decisions was to retain Manchester United striker Rooney as his skipper. Rooney is set to lead England in Saturday’s World Cup qualifier against Malta at Wembley and the 30-year-old is eager to focus on football after a difficult period for the national side. “We need to build on the three points we won in the last game [against Slovakia] and the other side of it isn’t our issue, it’s nothing for us to be concerned about,” Rooney said today. “It’s a shame, everyone could see how excited Sam was for the job and he came in and showed that enthusiasm to the players. “It’s a shame it’s happened and I’m sure he deeply regrets it. It was a decision for the FA to take. The start of Rooney’s England career intersected briefly with the end of Southgate’s international days just over a decade ago. And Rooney backed the temporary appointment of the England U21 boss as the ideal solution to a difficult situation. “He’s done a very good job with the U21s and he’s got an opportunity to show what he can do at senior level,” Rooney said. Rooney’s role with England has been under heavy scrutiny since his lacklustre displays during a disappointing Euro 2016 campaign. Relieved that Southgate remains on his side, Rooney hopes to repay his faith against Malta and then Slovenia in another qualifier next Tuesday. “There was a lot of talk over whether I’d be captain or not so it was good Gareth put that to bed quite early and there wasn’t the speculation,” Rooney said. Email “'It's a shame it's happened and I'm sure he deeply regrets it' - Rooney on Allardyce debacle”. Feedback on “'It's a shame it's happened and I'm sure he deeply regrets it' - Rooney on Allardyce debacle”.